The list below is meant to be a guide to where to find a variety of repair shops in Toronto. 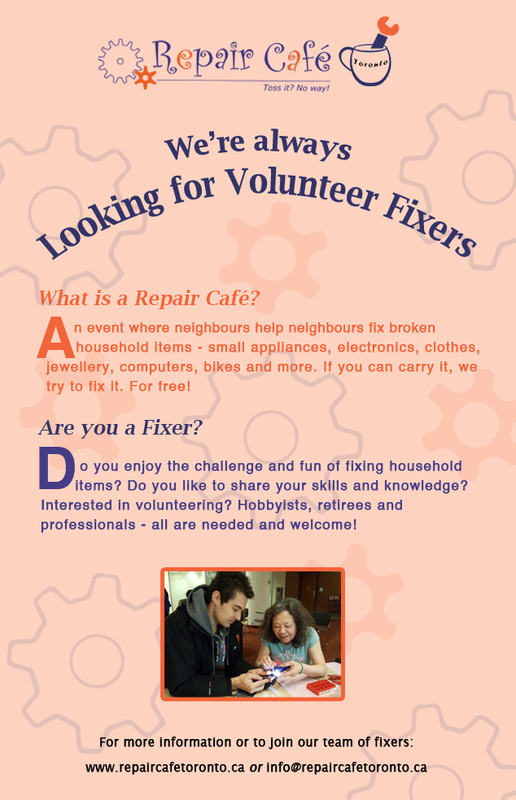 We want to help you find the repair services you seek and support small local repair businesses in Toronto. For the most part, this list does not include bicycles, computer and cell phones because these repair services are plentiful in the city. Neither does it include large appliance nor automobile services. Should you wish to recommend a particular repair shop for this list, please let us know. For the first version of this list, someone from RCT visited the shops identified, to explain the list, seek permission for their inclusion and confirm that the business is primarily a repair shop. To be clear, RCT is independent from any of the shops on the list. We assume no responsibility for any unsatisfactory dealings with these businesses that might possibly occur. We would very much appreciate your feedback (positive or negative) resulting from your use of these shops to help us provide appropriate information with others.